Birth of Arthur Worton registered June quarter 1893 at Dudley. Arthur’s mother Elizabeth died in 1893. At the time of the 1901 Census, Arthur’s 4 elder brothers were still living with their father, but Arthur was living with his aunt and uncle. 35 Brook Road, Woodsetton, Staffordshire. Joseph Worton (48, Widower, Coal Miner – Hewer, born Ettingshall), and his 4 children: Joseph (17, Fender Moulder, born Woodsetton), Thomas (16, Fender Moulder, born Woodsetton), William (14, Tailor, born Woodsetton), and Daniel (12, Tailor, born Woodsetton). Ettingshall Lane, Ettingshall, Sedgley, Staffordshire. George H. Colburn (36, Cast Iron Moulder, born Sedgley), his wife Emma (39, born Sedgley) and their nephew: Arthur Worton (8, born Sedgley). By 1911 Arthur’s father Joseph had remarried; the elder brothers had all moved out leaving just Arthur now re-united with his father and step-mother. 6 Sedgley Road, Woodsetton, Staffordshire. Joseph Worton (57, Coal Miner – Hewer, born Coseley), his second wife of 4 years Emma (49, born Coseley), and his son by a former wife: Arthur (18, Clerk at Sanitary Engineering company, born Coseley). It has been difficult to positively identify A. Worton, but it is strongly belived that this is the correct man. The Commonwealth War Graves Commission has 3 casualties named ‘A. Worton’; we can dismiss 2 of the 3 which leaves Arthur Worton, 1st Garrison Battalion, Northumberland Fusiliers who died in Malta in 1919. At first sight this seems an unusual regiment for a Woodsetton man, but Arthur initially served with the 2/5th South Staffords which looks more likely. Arthur was probably wounded, sick, or otherwise incapacitated whilst with the South Staffords and no longer fit for front-line soldiering, but thought capable of performing a role in the Malta Garrison force. Unfortunately his Soldier’s Papers did not survive the Blitz. Since the above papargraph was first written, “Soldier’s Effects” papers have been added to ancestry.co.uk. For Arthur Worton this shows that his War Gratuity of £6/15/4 was paid to his widow Edith M. Worton. this helps to tie Arthur down to the Woodsetton area, as the marriage of Arthur Worton and Edith M. Clarke was registered in June quarter 1914 in Dudley, this was the only marriage of an Arthur Worton to a lady named Edith between 1900 and 1919. The 1st (Garrison) Battalion, Northumberland Fusiliers was formed in August 1915 and served all the war in Malta. They were stationed at Polverista, with their HQ on Manoel Island in Marsamuscetto Harbour, and provided detachments for guard duties at Verdala and St. Clements Prisoner of War camps. Malta was an important staging post in the Mediterranean and a vital supply and hospital base, as well as accomodating German prisoners of war. The men of the Garrison battalions tended to be made up of older and medically downgraded men. 13 men from 1st (Garrison) battalion died and are buried in Malta. In July 1919 the battalion numbered just 15 officers and 171 rank and file, and remained on Malta, with decreasing numbers, until November 1920. Arthur Worton’s name is also commemorated on the memorial at St. Peter’s Church, Upper Gornal. Arthur is shown as ‘Died’, this usually means having died from sickness or due to an accident, rather than from wounds received in action. In January 1919 the ‘Spanish Flu’ pandemic was wide-spread so it is possible that this was the cause of Arthur’s death. 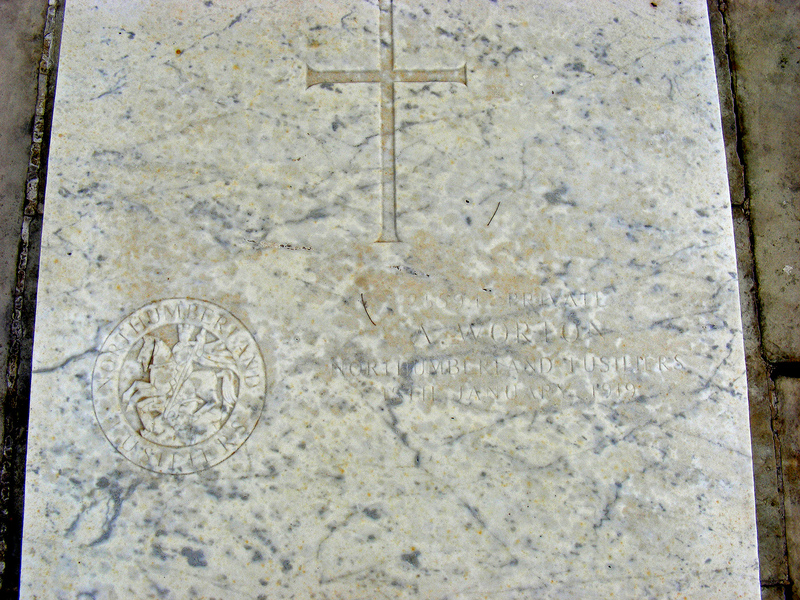 Arthur is buried in Pieta Military Cemetery, Malta.